WRAPUP: A bit of early evening drizzle did not dampen the enthusiasm for hanging out at the worlds coolest Hot Dog place. 40 MINIs, Mini, Lotus, and a few other cars showed up over the evening from such faraway places as Madison, Milwaukee, and even New Jersey (plus a bunch of people from much closer). A really great evening to hang out and visit, look at cool cars, have some great food, and enjoy each others company. Huge thanks to Arnie for making all the arrangements to provide for such a fun evening, even though he was unable to attend.. Please send links to photos to steve@chicagominiclub.com , and I’ll add them here. 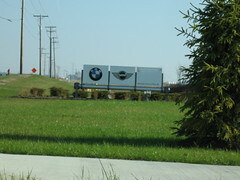 WRAPUP: Over 40 BMWs and MINIs met for a perfect Saturday Morning drive to the BMW/MINI Distribution Center in Minooka. We were treated to snacks and fruit, and a presentation of the workings of the Distribution Center. 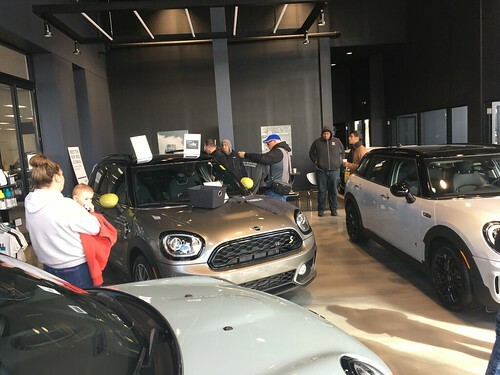 We then took a tour of the center with an in depth description of the workings of hoow the parts are brought in, stored, picked, and readied for delivery to over 30 area MINI and BMW dealerships. After a wonderfull lunch, there was a raffle for many gifts and we all lined up for a group photo. Huge thanks to Robert, Carla, and all the staff who volunteered their day to show us such a great time, and to Meg from the Windy City BMW Club for organizing the event and inviting the CMMC to participate!! WRAPUP: 15 or so MINIs headed out for a beautiful morning drive up Sheridan Road. We reached our destination at Axels Automotive and were joined by another half dozen or so MINIs (and Mini). After some visiting and food we went into the Shop area and were treated to demos of a rear brake rotor and pad change, alignment and road force tire balancing. We were able to ask questions, and see all the details up close and in person. Nick and Axel even checked out a few other problems on peoples cars. They then fired up the grill and treated us to cheeseburgers, drinks and chips. What a great chance to hang out and learn a bunch about our MINIs! Huge thanks to Axel, Nick and their entire crew for opening up their place to us, and taking such good care of our club.